"The Way These Things Begin"
I burned it all today. The whole shot. I tore all the posters and pictures from the walls. Anything that was glass, I smashed. Anything that was plastic, I cracked and snapped and threw at the wall. All of it. It's just a smoldering pile of trash now. I'm going to check in the morning, but I made pretty sure there would be nothing but ashes. I'll lose my mind if there's even a glimpse of that crest. And the crest. "Hope". What a load of crap. It fooled me once. It fooled Mike. It killed Mike. Superman and his famous "hope" killed my big brother. Well, I ain't being fooled by it again. If Mike had just gotten out of the car a second quicker... The train just... It was so loud. All that metal and glass twisting and crushing together, and... Mike... So much for hope. So much for Superman. And what do people know? They're all telling me how sorry they are, that it must be hard for me. Like they all understand or something. Even strangers, like that reporter jerk who came to Mike's funeral. Cant or Kent or something. Telling me he wished it all ended differently. Who isn't wishing for that?! What does he know about loss? Forget that creep. It doesn't matter now anyway. Nothing really matters. Mike's gone. And it's Superman's fault. And I swear, sometime, I'll find a way to make Superman pay. One day I'm gonna wrap that cape around his neck and ask him if he remembers my big brother. And when he says 'yes', because he remembers everything, that's when I'll make Superman himself burn. 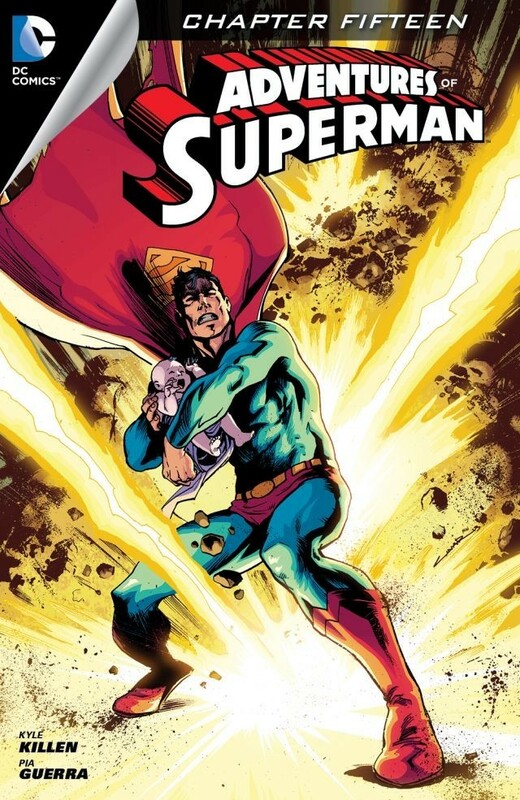 Story - 4: Conceptually, this is my favorite issue of Adventures of Superman, so far. Like so many of the issues in this title, Superman isn't actually the focus of the story. It takes a simple Luthor-centric premise, spins it, and gives us one of the most diabolical Luthor plans these two peepers have yet read. Luthor reserves himself to being the one not to kill Superman, but rather the catalyst that creates disturbed minds that wish to kill the Man of Steel as much as he. It's a refreshing view of Luthor. Unfortunately, this kind of Luthor can only work in a one-shot from an out-of-continuity story. Even if Luthor is in jail for the long haul, he's concocted the perfect plan to deal with his unmet desire to pummel Superman: get an army of lunatics to do it for him. Luthor simply has to play his brilliant manipulation game again and again and again until the Anti-Superman Army is in full swing. That wouldn't work for in-continuity stories for two reasons. First, it would cripple Lex Luthor as a character. He would be flat and there would be no incentive for any writer to invent plots in which Luthor is important. Second, it negates Luthor's often in-continuity desire to be the only one squeezing the life out of Superman, which is, honestly, more interesting from a long term storytelling perspective. Nonetheless, the premise works excellently in this little out-of-continuity tale. On top of all that, having Superman actually fail was gripping. The build-up to the panel where the train destroys the car with Mike inside was truly suspenseful. It's hard to guess where the story is going before that scene, but Superman failing is what made this story exceptional. If he had saved Mike, this would have been just another Superman story where he saves a kid from a boneheaded idea and tosses Luthor in jail, with the latter wringing his hands pondering his next devious plan. But Superman didn't, and the story isn't. It was touched on in issue #12 how Superman actually can't save everyone, at least not physically. He can inspire us to be greater, and therefore save us from our self-doubts and uncertainties, but he truly can't stop every accident, can't catch every falling person, rescue every cat from a tree, prevent every murder, nab every corrupt land owner, and so on. I think deeply in our fan-minds, we know this, but perhaps many of us don't want to see it. I do want to see it. It presents on the page - or in this case, the tablet - a step away from the norm, where Supes can do everything, and even if it seems like he can't for a moment, he probably will come out on top in the end. Superman loses in this story, and we can see by his attendance of Mike's funeral as Clark that it hurt him deeply. And that's where we're reassured that he's Superman. In the end this isn't a Superman story or Luthor story. It's the origin story of a supervillain. Art - 4: Some of the scenes in this issue are very nice to look at. The most disturbing scene - the train hitting the car - is a full panel and it just pops with shock, grief, and helplessness. I think Superman looks a little too slim, almost like how the Flash should be drawn, but overall the art compliments the story and stands tall enough under its own merits.